A unique cultural experience, which opens simultaneously the doors to two leading world markets, while providing graduate students with excellent competence in advanced science and technology. This program aims at internationally aware and highly motivated students, with an above-average performance in their previous studies (i.e. Bachelor of Science or equivalent). 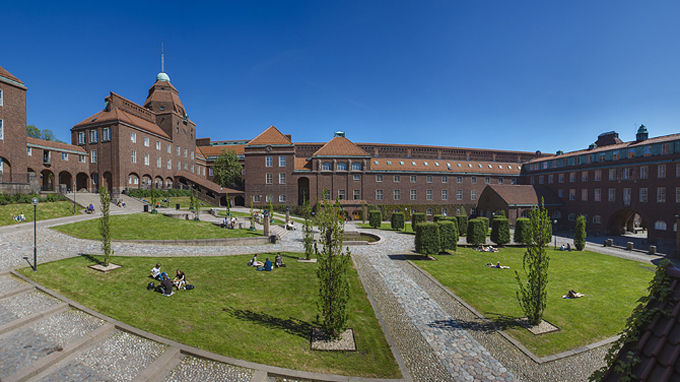 The DD with KTH is a 2.5 to 3 year program, consisting of five to six semesters. KTH students spend two semesters at KTH and three semesters at the TUM, TUM students spend two semesters at TUM and three to four semesters at KTH. Tuition is in English. Some specializations are offered in German. The program has a workload of at least 150 ECTS credit points. The students are enrolled both at KTH and at the TUM, but tuition fees only have to be paid according to the existing regulations at the home university. When staying at the partner university, the students benefit as well from the ERASMUS financial support during the first year. The graduates are entitled both degrees: Civilingenjörsexam (Master of Science in Engineering) at KTH and Master of Science at the TUM. have to be fulfilled. For KTH student this implies that they need to have passed the courses SI1151 Quantum Physics or SI2380 Advanced Quantum Mechanics, SH2302 Nuclear Physics or SH2103 Subatomic Physics or SH2203 Experimental Particle Physics or SI2400 Theoretical Particle Physics, and IM2601 Solid State Physics, or equivalent to these courses, before arriving to the TUM. If your home university is KTH, please contact the International Coordinator of the School of Engineering, Elin Wiljergård. If your home university is TUM and you are enrolled in the first year of a Master program in physics, you have to apply to the international program at TUM. Simultaneous application to ERASMUS+ SMS is possible, being the application deadline for both programs on January 15th 2019 at 12:00 noon. curriculum vitae in English, including a photo, internships, language skills (e.g. A1-C2), social commitment (e.g. fellow program), hobbies, etc. A printed and signed copy of the TUM online application form has to be submitted personally to the academic advisor for internationalization in the Physics Department (how to fill in the online application form „Outgoing - Erasmus SMS, Switzerland and Double Degree 2017/18“). When filling out the TUM online application in the Outgoing Portal of our International Center, you will also have to upload the above mentioned documents as well as a document certifying your English language skills (DAAD language test, TUM language course, Abitur certificate, etc.). To support international exchange students in their accommodation search, our International Center has organized an accommodation exchange platform. Regular TUM students going abroad, can offer their rooms or apartments for sublet. You will find more information at International Center's website. These offers only apply to incoming exchange students coming to TUM for 1 to 2 semesters. If you would like to exchange your room with a double degree student from KTH, please contact the academic advisor for internationalization in the Physics Department. The student will follow an individual study plan, approved by both program coordinators. The study plan will follow the guidelines described in this section. Students follow the first year of studies at KTH, please inform yourself about the courses that you need to take to apply for the program. The student must complete at least 30 ECTS points of the first year of the chosen Master program, which normally includes: 10 ECTS corresponding Theoretical Physics course to the specialisation, 30 ECTS in special courses (at least 20 ECTS from the chosen specialisation), 6 ECTS Advanced Lab Course (at least 4 ECTS from the chosen specialisation), 8 ECTS non-physics elective courses, 4 ECTS student seminar and 2 ECTS soft skills. The catalogues for non-physics elective courses, student seminars and soft skills are open catalogues and new courses may be included upon request of a student. The courses the student can choose, will depend on previous attended courses at KTH and have to be discussed on a case-to-case basis. During the last two semesters at TUM, KTH students will work on their master thesis following the usual TUM requirements (12 months of full-time work in a topic related to the chosen specialisation at TUM, including a written work and a colloquium presenting the final results). The students should produce one final thesis, common for both Master’s degrees in English with abstracts in English, German and Swedish, which shall be defined and supervised by professors at both institutions and presented at both institutions. The student must complete 60 ECTS points accordingly to the first year of the chosen Master program: 10 ECTS corresponding Theoretical Physics course to the specialisation, 30 ECTS in special courses (at least 20 ECTS from the chosen specialisation), 6 ECTS Advanced Lab Course (at least 4 ECTS from the chosen specialisation), 8 ECTS non-physics elective courses, 4 ECTS student seminar and 2 ECTS soft skills. The catalogues for non-physics elective courses, student seminars and soft skills are open catalogues and new courses may be included upon request of a student. The students must complete 30 ECTS in master courses in e.g. Engineering Physics (five specialisations: Biomedical Physics, Nano Physics, Optical Physics, Subatomic and Astrophysics and Theoretical Physics), Nuclear Energy Engineering or Mathematics. During the last two semesters at KTH, TUM students will work on their master thesis following the usual TUM requirements (12 months of full-time work in a topic related to the chosen specialisation at TUM, including a written work and a colloquium presenting the final results). The students should produce one final thesis, common for both Master’s degrees in English with abstracts in English, German and Swedish, which shall be defined and supervised by professors at both institutions and presented at both institutions. Parallel to these, the students must complete up to 30 ECTS in Swedish language courses, in order to pass all four Swedish language courses offered at KTH or pass the Swedish language test for higher education TISUS (equivalent to B2). Prior knowledge of the language will be assessed with a language test and less courses would then have to be completed. The student will be enrolled at the home university at the beginning of the program. From the moment the student goes to the guest university, (s)he is enrolled in both universities. KTH students spend the third, fourth and fifth semester at TUM, while TUM students spend the third, fourth, fifth and possibly sixth semester at KTH. Depending on the home university, an overall semester plan is proposed. The core of the program are the special courses. KTH students may choose from the special courses in physics, depending on their specialization. As a general rule for the language, courses counting towards the specialization in Applied and Engineering Physics are taught in English, all others have be checked individually. This list is revised before the start of each winter semester and the filter can be used to look up courses in a given semester. Available courses are those belonging to e.g. Engineering Physics (five specialisations: Biomedical Physics, Nano Physics, Optical Physics, Subatomic and Astrophysics and Theoretical Physics), Nuclear Energy Engineering or Mathematics. All courses are offered in English. Minor revisions of the list take place every year before the fall term. Please let us know if information is outdated or incorrect by contacting Leticia Fimiani. Double Degrees are a fundamental activity of T.I.M.E., as the association believes that its model of in-depth, bi-cultural learning and the mobile, flexible, high-quality graduates it produces are more relevant than ever.